Rep. Don Turner at a Statehouse press conference Wednesday. The top Republicans in the Vermont House and Senate on Wednesday called for a federal investigation into anonymous allegations of fraud allegedly perpetrated by the state's health exchange vendor. In a letter to U.S. Attorney Tristram Coffin, Rep. Don Turner (R-Milton) and Sen. Joe Benning (R-Caledonia) wrote that there was "sufficient legal and factual predicate to begin a federal investigation" into whether CGI Technologies and Solutions had defrauded the state. The allegations relate to a demonstration CGI officials conducted for state workers last summer to showcase their progress building Vermont Health Connect, the state's version of a federally mandated, online insurance marketplace. While billed as a live demonstration of the site's connection to the Federal Data Services Hub, an anonymous source quoted in a recent Newsweek story alleged that "the system was in no way operable" at the time. In their letter to Coffin, Turner and Benning cited as evidence the Newsweek story and an unsigned letter they attached from a person claiming to be a "Vermont Health Connect team member." 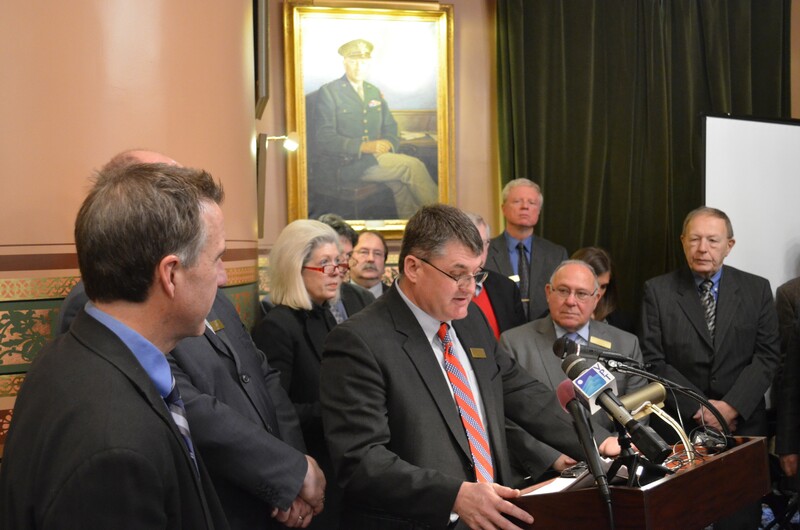 "As minority leaders of the Vermont House and Senate, we hereby formally request a federal investigation into whistleblower allegations alleging a fraudulent software demonstration on July 26, 2013, by [CGI] to Vermont officials charged with overseeing and monitoring the company's state contract," Turner and Benning wrote. A spokeswoman for CGI quickly disputed the allegations Wednesday. "CGI confirms that the demonstration on July 26, 2013, included a live interface to the Federal Data Services Hub, with the real time sending and receiving of data," said Linda Odorisio, the company's vice president for communications. Members of Gov. Peter Shumlin's administration have previously pushed back on the Newsweek story and called into question the magazine's reporting. They produced documentation showing that Vermont Health Connect had, in fact, connected to the data hub just two days before the demonstration. Citing that documentation and CGI's statement, Department of Vermont Health Access Commissioner Mark Larson disputed the substance of the Republicans' letter Wednesday and accused the legislators of "stoking fear." "We think it's unwarranted to seek a federal investigation based on an anonymous allegation that does not match the facts," Larson said in a written statement. "Those who are calling for this are stoking fear, diverting resources and wasting time, when what we really need is access to quality health care. That is exactly what Vermont Health Connect is providing to thousands of Vermonters." Coffin said Wednesday he had received the letter, but he declined to say whether he would take action on it. "We don't comment on the initiation or pendency of investigations and we won't confirm or deny the existence of any investigation," he said. The two Republican leaders noted that former state auditor and 2012 Republican gubernatorial candidate Randy Brock had raised similar concerns in a September op-ed. But, they said, "To our knowledge, Vermont Governor Peter Shumlin's administration has not investigated the alleged fraudulent demonstration." Vermont Health Connect has experienced extensive delays in functionality. It still cannot process payments online or enroll small businesses and their employees. "We believe the unexplained and extensive delay, coupled with evidence suggesting the company in charge of designing the system may have duped Vermont officials into incorrectly thinking that the software system was working and on schedule, constitutes sufficient legal and factual predicate to begin a federal investigation," Turner and Benning wrote. "If true, such a fraud prevented state officials from performing proper contractual oversight, prevented corrective measures, and helped CGI retain its multi-million dollar contract with the state."